The Christmas and New year celebrations are just around the corner and all pet owners queue to grab the latest fashion collection for their dogs' clothes. Big brands have released excellent designs and collections for the pets this year. The competition among the big brands are so high that they try to come out with outfits that can suit specific breeds of small dogs. Some small breeds of dogs were never meant to be a symbol of fashion but the arrival of innovative and trendy small dog clothes has changed the entire outlook. Moreover, the dog couture has also hosted some vibrant colors and patterns for smaller dogs. So, are you also ready to dress up your little one in style? Frankly speaking, your self-style plays a great role in the selection of a dress for your little dog. You can either display your own style or project the personality of the dog through trendy clothes that express their style statement. 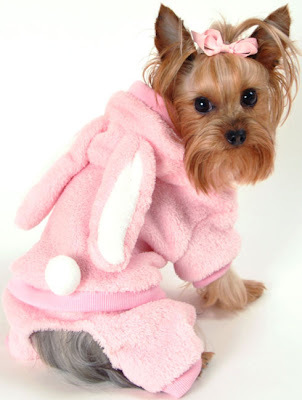 One of the most popular fashion trend is to match the dog clothing with your own. The little dog dresses in the same color as its owner with matching boots, hat, glasses and collars. However, this is a very top notch look which many owners cannot afford. Another fun style in vogue this year is the display of some phrases or sayings on the dress of your little fur animal. These dresses are customized according to the owner's choice. Most owners prefer to get their own thoughts published through their dog dresses. What can be more wonderful than a little dog walking with a smart statement on its dress? These dresses are aimed to be comfortable for the dog as well as to reflect the latest fashion. The bright lace dresses with a bough, collar and belt are getting into the wardrobe of every tiny dog. The lace wear is complemented with a puppy lock feather to provide a look makeover to the pet. Puppy lock feathers are hair extensions which make the small pets appear more attractive with thick and shiny feathers. These feathers are attached to the dog with the help of a silicon micro-bead that can be pasted and removed easily. Rich winter coats made of mink highlighted with bright colors of fur and topped with embroidery have been released this fall. 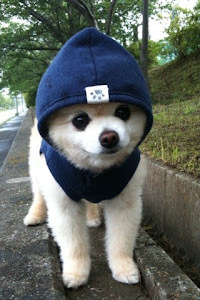 These coats provide warmth and comfort for the small dog in cold winters. These coats are accompanied by Velcro necks and belly bands to provide modifiable fit. France has released a luxury wear, especially for small dogs. The handcrafted couture coat with embodiments of beads and sequins on the top is the designer feature of this brand. Apart from this, woolen frocks with polka dots and matching belly belts have already hit the list of best selling small dog clothes this season. This hands-on update on the latest trends in small dog clothes can definitely help you choose the best outfit for your tiny pet. Dress your small dog in fashion but never compromise on its comfort level. Small dogs are adorable and these dresses can make them look gorgeous to everyone.